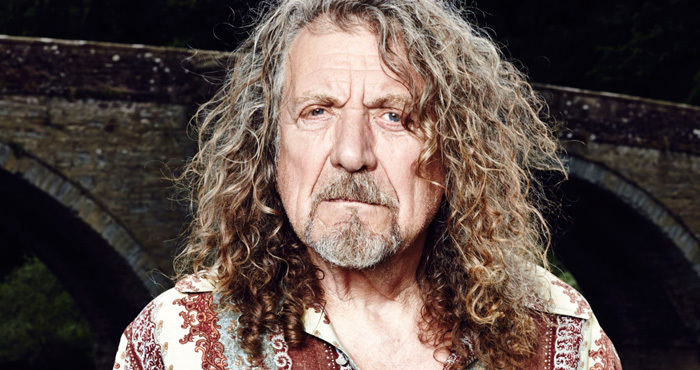 Perhaps the most influential rock singer in history, English singer-songwriter and musician Robert Plant possessed a highly powerful and wide vocal range. Best known as the lead vocalist and frontman of the legendary rock band Led Zeppelin, he has also had a remarkable solo career, and collaborated with artists like Alison Krauss, Patty Griffin and T-Bone Burnett. Born “Robert Anthony Plant” in Staffordshire, England in 1948, his father was a civil engineer who worked in the Royal Air Force during World War II. Plant attended King Edward VI Grammar School for Boys and developed an early interest in music after listening to Elvis Presley and the work of earlier blues artists such as Willie Dixon, Robert Johnson and Bukka White. Robert Plant left home at the age of sixteen to become part of the English Midlands blues scene. He sang with a number of bands, including the Crawling King Snakes, the Band of Joy, and Hobstweedle. Plant was recommended to Jimmy Page by Terry Reid. Page, at the time, was forming a band called the New Yardbirds. Plant was hired immediately after the audition and the band was renamed Led Zeppelin in 1968. Plant’s contributions and charisma were instrumental in establishing Led Zeppelin as the biggest band of the 1970s, and one of the greatest bands in the history of rock music. After the break-up of Led Zeppelin, he embarked on a successful solo career, releasing his debut album Pictures at Eleven in 1982. In 1984, Plant put together a short-lived supergroup with Jimmy Page and Jeff Beck called The Honeydrippers. He also paired with Page from 1994 through 1998 under the title Page and Plant. He formed Strange Sensation in 2002, and released a series of critically acclaimed blues and folk remakes. From 2007 to 2008, Plant recorded and performed with bluegrass singer Alison Krauss. Their multi-platinum Grammy-winning duet album, Raising Sand, was released in October 2007. Led Zeppelin’s legendary performance at the 2007 Ahmet Ertegün Tribute Concert holds the Guinness World Record for the “Highest Demand for Tickets for One Music Concert”. Robert Plant has won numerous awards and accolades in his solo career and his career with Led Zeppelin. A few of include the Grammy Lifetime Achievement Award, several Grammy Hall of Fame inductions, the Polar Music Prize, the Ivor Novello Award, and Kennedy Center Honors. He has been inducted into the Rock and Roll Hall of Fame, the UK Music Hall of Fame, and the Mojo Hall of Fame 100. Robert Plant has been married only once, to Maureen Plant, in 1968. They had three children: Carmen Jane (born 1968), Karac Pendragon (born 1972), and Logan Romero (born 1979). The marriage ended in a divorce in 1983. Plant was also known for his many relationships with women during his Led Zeppelin days. He fathered Jesse Lee (born 1991), with Shirley Wilson, sister of his former wife Maureen.